Yes, I let my dogs eat from the table. I admit it; I’m a bad pet owner. And while usually they wouldn’t agree with that assessment, there are two times they definitely would. Let me first assure you that my wife, Teresa, doesn’t approve of my dog-feeding habits, so I have to sneak them small amounts under the table. They gather around me, positioned like hours on the clock. It’s not every day, not every meal, but often enough that they play the lottery and keep staring at me, the one-armed bandit, who always sneaks the food down with his left hand so I can still eat with my right and Teresa doesn’t suspect a thing. There are, however, two times when I turn into a selfish monster. The first is when I’m eating some of Teresa’s homemade ice cream. My favorite dessert in the world, by a wide-margin, it’s vanilla chocolate chip and loaded with cream, whole milk, condensed milk, sugar, vanilla, eggs, salt, and loads of small dark chocolate chips. When I go down to the freezer to get a bowl, the dogs are on me like the “hounds of hell,” and follow my every step up to my massage chair where I get massaged, watch TV, and savor every single bite of ice cream. There are two reasons I don’t want them to eat ice cream. One, I don’t want them to consume chocolate. Two, and this is the biggest reason, I don’t want to share my ice cream with them. Almost anything else they can have my share, but not Teresa’s homemade ice cream (that I can only eat about 4-6 batches of per year, or I’d double my weight quickly). The other is turkey. Teresa is the master of moist, flavorful, perfectly-cooked turkey. Whether she smokes the bird in our smoker or cooks it in our Green Egg, it comes out tasting of the citrus brine and smoky pecan wood, turkey that just melts in your mouth. Again, the dogs are standing up on hind legs like Roy Roger’s horse, Trigger, raking the air with their front feet. They root with their noses, scratch with their feet, often even pull the napkins off of my lap to get my attention, and more importantly, some turkey. There you have it: All my sins. 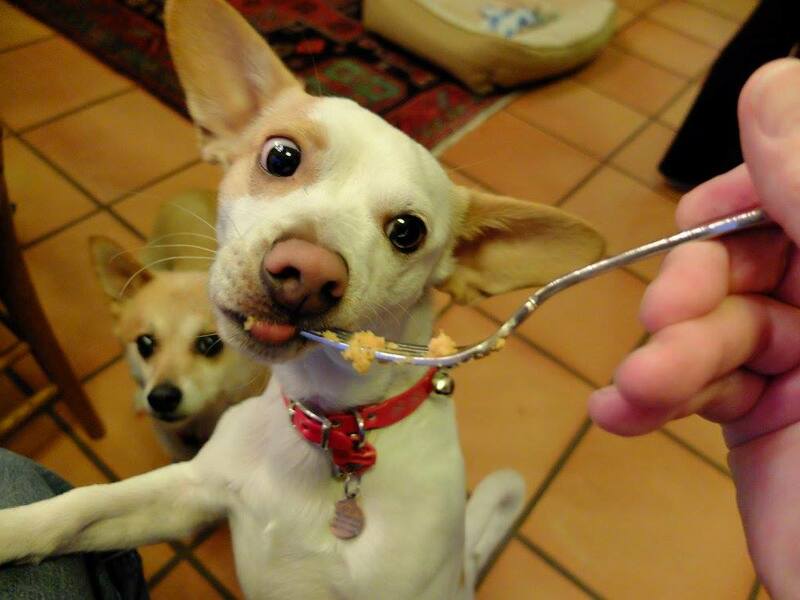 How about you — do you sometimes or frequently feed your pets at the table? And if you do, is there any food you absolutely, positively, keep to yourself?